The boom design is fairly common and can be used in many different situations that vehicles find themselves in. This truck has an adjustable hydraulic boom arm that can extend great lengths to reach a problem. This boom has a winch attached to it where it can be attached to a vehicle and then be pulled out of the stuck situation. Different material, often rubber, is used at the end of the winch in order to protect the vehicle from damage. A wheel-lift type of tow truck has no boom but just a simple hydraulic yoke on the rear. This wheel-lift is placed under the drive wheels of a vehicle, lifting them off the ground in order to tow the vehicle on the non-drive wheels. It’s a simple design but very useful in normal incidents on the highway where a vehicle is not off the road in a ditch or stuck in a difficult situation. Most of these type of trucks just lift the wheels of a vehicle but larger wheel-lifts are designed to lift the axle on heavy trucks, semis or buses. An integrated system uses a combined model of the boom and wheel-lift models where a wheel-lift on the rear is attached to a smaller hydraulic boom. These trucks are designed for fast and quick pickup of vehicles and are used a lot by repossession companies or to haul off vehicles illegally parked in a parking lot or in a no parking zone. Many design have cameras and controls in the cab, allowing the driver to stay in the vehicle to execute the whole attaching and lifting process. This prevents them from having to waste time exiting the truck and manually attached anything to the vehicle, also saving them time from any confrontation. A flatbed truck is just as it sounds, where the back of the tow truck has a bed to haul vehicles completely off the ground. Just like a dump truck, a flatbed is designed with a hydraulic lift to incline the bed up and slide it down next to the broken vehicle. A winch on the front of the bed is used to attached to the vehicle and pull it completely up onto the bed of the truck. This design is very useful in accidents where the vehicle has been damaged and truly needs a lift. Or when long distant towing is needed, having the all four wheels off the ground saves the vehicle a lot of wear and tear, even if it is just being pulled on the non-drive wheels. Hundreds of miles can take its toll on any vehicle. A unique type of tow truck is the lift flatbed and is not that common in America. This design has a boom that acts like a large crane to simply lift the vehicle up and place it on the bed of the truck for hauling. The idea comes from the situation of a vehicle having obstacles on both the front and back of it with no place for a truck to pull up to and hook up to the vehicle. On everyday streets in a city of town, parallel parking is one situation this design can be used to extricate a car from. There are many different designs of needed to accomplish the jobs of many types of industries. Where we might only think of passenger cars and trucks, tow trucks are needed to haul broken buses, semis, large construction equipment and even military vehicles. Local city departments often need their help too with fire, police, and plow vehicles that are used every day and are in constant need of repair. 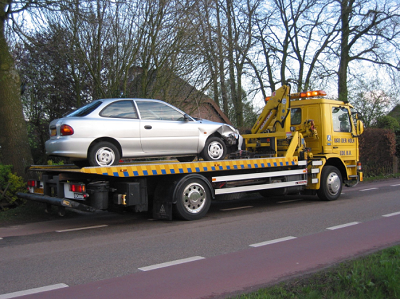 Though always an inconvenience with timing when they occur, towing services save many problems from escalating and actually save time with their effecting solution.